Posted on March 15, 2017 , in Elliptical Machines. If you’re a fan of the smooth workout an elliptical trainer provides, you may assume that there is little you have to consider to get the best workout possible. In fact, there are many things you can do to make your elliptical workout even better. Below you’ll learn 5 tips for how to get even more out of your elliptical workout. It’s easy to glide along with your elliptical machine, just going through the motions, but the best way to maximize your workout is to use the resistance settings. Start out with normal resistance. Then, whenever you feel like you aren’t working as hard as you could be, increase the resistance to the next level. As your body gets stronger, you’ll have to increase the resistance further to keep yourself challenged. If you don’t enter your age and weight at the beginning of your workout, the calorie count the elliptical provides won’t be correct. Take the time to enter this information so you’ll get an accurate readout of your progress. Once you’ve calibrated your elliptical trainer, adjust your resistance and pace so you are burning 100 calories per 10 minutes. This will ensure that you’re making the most of your workout. Most people start their elliptical workout in the forward direction but never change it. Even more people never use their arms during an elliptical workout. Changing your direction and going backward is a great way to work out different muscle groups like your hamstrings and glutes and keep yourself challenged. It will also prevent boredom with your workout and keep you motivated. Also make sure to grab the handles and use a pushing and pulling motion to work out your arms, rather than simply using the handles for balance. If you find yourself slouched over onto the armrests of the elliptical trainer during your workout, you’ll want to improve your posture. 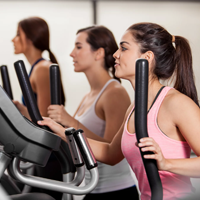 The correct posture for using an elliptical is standing up straight on the machine. In this position, your core is more engaged and your abs lengthen. Your upper body will also work harder when you stand up straight. Most people use elliptical trainers incorrectly, leaning forward and placing their weight on the ball of their foot while their heel raises up off the platform. Not only does this prevent you from getting as much as possible out of your workout, but it also puts pressure on your toes and knees and can lead to injuries. Instead, stand up straight and put pressure on your heels. This will properly distribute your weight and ensure that your muscle groups are working as hard as possible. Now that you’ve learned how to get the most out of your elliptical workout, download our monthly promotion for ways to save on fitness equipment.